My hands are REALLy, REALLY dry--and winter isn't even here yet! 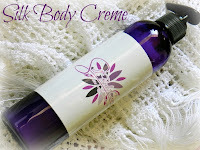 I was given a sample of Silk Body Creme and enjoy how moisturizing it is! I like to use it in the morning when I KNOW my day will be filled with messes, dishes, laundry, dirty diapers and LOTS of washing my hands. It has a nice sweet fragrance that doesn't over power your nose. This great product is handmade in the USA and is a GREAT gift idea! Teachers, coaches, bus drivers, secretaries, or neighbors could all benefit from this product this winter! I'm fairly picky when it comes to lotions, and I really like this ultra-thick creme that keeps my hands moisturized. If you like what you read, I hope you will check out the website.